Pohjola’s strength is his ability to make something new of these influences and concepts. The empathy of the trio — plus guest guitarist Mick Goodrick on six tracks (including the three different sightings of “The Bear” that serve as strategically placed interludes) — reinforces the unity of the compositions. Pohjola, as a pianist, is a master of tension and release, bassist Bruno Råberg (Full Circle, Orange Then Blue) complements and swings, drummer Robert Dani (Enrico Rava, Devil Doll) delivers both power and delicacy, and guitarist Goodrick is his unpredictably delightful self, whether burning, rambling or singing lyrically. Original music, unique concepts, extraordinary playing — it all adds up to one of the most persuasive debut albums in recent memory. 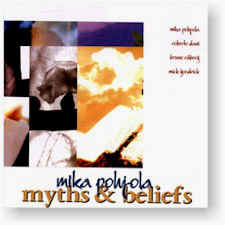 All compositions by Mika Pohjola. Recorded on 12, 14 December 1994 at Thin Ice Productions in North Andover, Massachusetts.